In 2004 a Treasure Vase was buried near the source of the Amazon River by Vijali Hamilton. Vijali is a sculptor, artist, writer and filmmaker. Her World Wheel Project has taken her to many places around the world where she engages with communities using art and activism to inspire a vision of peace. 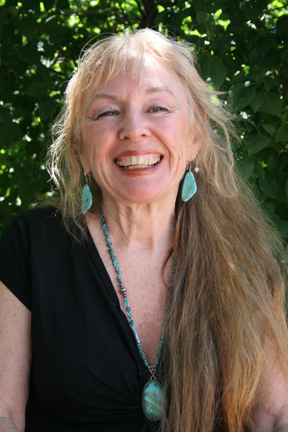 I have known her since the 1970s when her personal story of transformation and her carved rock sculptures in remote wilderness areas inspired me. When I learned she was going to the Amazon, I asked if she would take one of our vases to the source of that great river to carry our prayers along its length. She agreed and this is her story. An Earth Treasure Vase was given to me by Buddhist teacher, Cynthia Jurs, in a ceremony held in a cave where I live in Utah. I had been preparing to leave for the Amazon on my World Wheel project to start a nature reserve and center for the indigenous Shuar and it felt like a momentous meeting of our intentions. Upon arriving in the Andes of Ecuador and settling into the Otavalian village of Peguche — 3 km from Otavalo where I had carved a boulder with the villagers earlier — I sat on my bed holding the earthen clay form that just fit in my two hands, grateful that the vase was safe. With a few friends, we made a pilgrimage into the volcano Imbabura, which towers over the village and is considered the male presence of this valley at 10,000 feet. The Otavalian healer, Shairy Jose Quimbo, led us to the sacred sanctuary formed by a grouping of enormous boulders named Hiltan Rumi that looks out over a spectacular view of the Andes. Our group included a few friends from the States and three men from the village that had been my friends from previous trips. We made an altar for the Earth Treasure Vase with a red cloth I had brought for that purpose, placed herbs from the mountainside in the four directions with candles and incense, and meditated on peace with the vase. The people gathered and placed their offerings and prayers inside. I placed earth from the 13 sacred sites of the World Wheel pilgrimage into the vase and Shairy placed a stone, earth and herbs from Imbabura into the vase. As part of the ceremony, Shairy danced the Condor dance and I danced the Eagle dance that had been passed on to me by a Hopi elder, bringing the Mayan prophesy alive. This prophecy states that “when the energies of the Eagle (North America) and the Condor (South America) come together, a new life will be born on this planet.” At that moment, initiating that birth as an offering into the Earth Treasure Vase, I had the sense that our dance was contributing to the healing that needs to take place in our world to bring a balance between the male and female in our societies. A few days later we made another pilgrimage to the volcano Cotacachi, who reigns over the valley as the feminine presence. I felt her energy was particularly important to the vase. We hiked down a rather steep slope into the water-filled crater of the volcano. One location particularly called to us with a riveting view of the blue volcanic lake holding one side and the crater’s slope on the other. I spread my red cloth on the ground to form an altar. After we gathered in a circle meditating on peace in our own hearts, I offered the Gayatri mantra chant into the vase and earth from Cotacachi’s body. 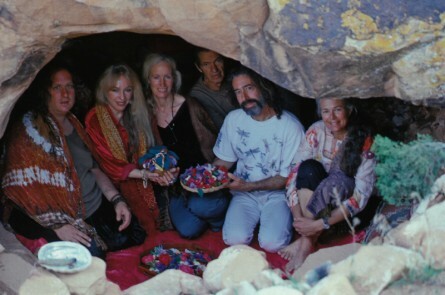 Each person offered herbs and flowers gathered from the hillsides and small objects they had brought with them. Shairy placed an herb into the vase saying, “This herb cures cancer, my mother showed me this plant.” The air was crisp from the altitude, the wind from the lake was potent and our hearts were laden with gratitude for this time together in the Andes and with the vase. I traveled on to the Amazon of Ecuador (east of Macas), 9 hours on a local bus and feeling all the time I was carrying my child in the form of the vase. My mind never left it. “Is the vase all right? Is it safe?” I always carried it by hand, or rather, by back. I had it in my daypack, wrapped in sacred scarves for protection. Its presence became more and more powerful as the pilgrimage advanced, as well as heavier! I also carried a picture of Green Tara for her energy of activism, for her nourishment, for protection of the green rainforest which all of our lives on the planet depend on, and for the waters of the world. When I arrived in the Amazon, I stayed with my indigenous Shuar friends. The first night we went into ceremony with the Shuar shaman, Chiriup, to injest ayahuasca, a sacred healing medicine. The shaman went into trance and began singing as the spirit entered him. I was seated in meditation, holding the presence of peace in my heart. The shaman picked up the vase and sang his spirit and blew his power breath into the vase. For a long time he continued to hold it in his hands and sing into it. After the ceremony, we all feel asleep in the thatched roof shelter with a fire dancing its flame-shadows against the intricately constructed bamboo dwelling. A giant ayahuasca vine was wreathed at the base of the center pole – honored as the teacher plant of this culture. I had come there to purchase virgin forest land bordering the Yukias River for the Amazon Refuge Wisdom Center with my Shuar friends. After accomplishing our goal and officially putting the land in their name, I continued on my journey with the Earth Treasure Vase to find its burial spot at the headwaters of the Amazon River. Returning to Quito on the 9-hour bus, I then took another bus to Lima, Peru, which took a day and a half. My destination was Iquitos, Peru, a jungle town where the Amazon River begins, fed by many rivers. In Lima, I flew to Iquitos and arrived in the evening greeted by warm tropical breezes and equally warm faces and helpful residents. This jungle town running alongside the Amazon River has very few cars because there is no road into this Amazon region. You can only fly or get in by days and days of boat travel. Everyone got around on motorbikes or the local taxi — a three-wheeled bike with a fringed canopy. There are no tall buildings; only small colorful stores. Delightful after the metropolis of Lima. In my room at the Peru Hostel, I spread out a map and meditated to be guided to the right site for the vase. With my finger, I followed the Amazon River upstream toward its source and saw a tiny blue line feeding into this largest river in the world. I immediately felt that that blue line was the right place to bury the vase, flowing into the powerful and busy Amazon. I left my room to ask everyone I met about boats traveling up river. I returned to the hostel after receiving a jumble of information that was confusing. I was met by the bright face of the maid who asked, “What do you want to do here in Iquitos?” “I am looking for a way upriver,” I said. “I know just the person,” she answered, and handed me a green brochure with a yellow and black and blue macaw on the cover and the words, “Refugio Altiplano.” I read the brochure and something felt just right. I went outside and flagged down a rickshaw but soon discovered that the office was on the same street as the hostel only one and a half blocks away! A beautiful Peruvian woman named Doloris, tall and elegant with her long black hair and almond eyes, said, “There is a boat going tomorrow morning. We will be staying for four days.” Again, it felt just right. The next day, I joined Doloris and a Peruvian professor on the boat. After two hours we turned down that blue line that I had been drawn to on the map, a tributary named Tamshiyacu. This little river was more personal, beautiful with gorgeous trees dipping their branches into the canal as we wound our serpent-like way through the dense jungle. In half an hour we were climbing the bank and stepping into a tasteful but simple complex with traditional thatched roof structures. We first greeted the ocelot in his cage who was eager to lick and rub his face against my hand,. Walking around the grounds, I soon met the owner Scott Peterson, a tall, blond, Viking-looking man from the States who invited me to an ayahuasca ceremony that evening with two Shipibo shamans. After supper, Scott told stories about his many decades in South America, his studies of the medicinal plants, and his healing work. I shared my pleasure in being at Refugio Altiplano and how the timing was momentous because I had just bought land in the Amazon for a nature reserve. Seeing what he had done was a great inspiration to me. After everyone had retired, I told Scott about the Earth Treasure Vase and asked if we could have its presence in the ceremony that evening. He was intrigued and spoke with the two shamans who were lounging in the hammocks after our dinner. They were very sweet and liked the idea of having the vase in the ceremony. The evening was magical as we walked together in the moonlight through the forest into the ceremonial house, a two-story round structure with a thatched roof. In the large room the power from previous ceremonies permeated the rafters and wooden floor. Scott lit candles and blessed each guest, including the vase. After a time, the candles were blown out and we all sat in the dark silence until the spirit songs began to come to the shaman while under the influence of the ayahuasca. Each person was attended to in a healing ceremony that involved singing and blowing the spirit into each person, then the shaman went to the Earth Treasure Vase that I had set on the red altar cloth on the table before me. Both of them sang into the vase. One shaman fanned the air with leaves, moving the energy, as the other blew into the vase. They stayed for a long time in the presence of the Treasure Vase—until the songs stopped. The next day, three of us silently canoed further up the Tamshiyacu tributary, winding our way through fingerlets of water that reached into the dark forest. My body always knows first when something is right. And it was relaxing in a way that was saying to me, “This is the place. This is the final home for the Amazon Earth Treasure Vase.” That evening, the two Shipibo shamans performed another ayahuasca ceremony with Scott, me and the Earth Treasure Vase. The following morning, quietly and secretly, Scott and I buried the vase in the rainforest just off the riverlet Tamshiyacu. We buried it in a way that no one would ever know where it lies. We took turns digging the hole in the earth with Green Tara presiding over the ceremony. I removed the cork from the vase and chanted the Gayatri mantra into it. We said prayers for peace and made final offerings into the vase. I replaced the cork in the neck of the vase and lowered it into the earth. We took handfuls of earth and dropped it into the hole covering the vase. When it was filled, we camouflaged the surface with grasses so that the location would remain a secret. Back home now, I sense the imprint of the vase in my heart, as if my child had grown up, left home, and found her life destiny. I can feel its radiation of prayers for the Earth continually being sent out through roots and stone, soil and leaf mold, through the crust of our planet, circling the globe carrying the vibration of peace. This entry was posted on Thursday, June 6th, 2013 at 12:33 pm	and is filed under Burials. You can follow any responses to this entry through the RSS 2.0 feed. You can leave a response, or trackback from your own site. Hi, i was wondering if you can help me find sources to ask about a old vase I found in long ago in mt. Baldy by ariqeupa peru?